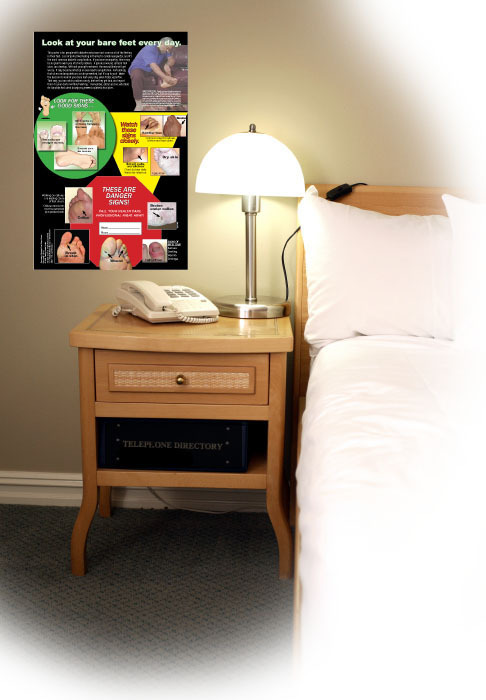 The Wall Poster helps patients with foot self-inspection at home. The Preventing Diabetic Foot Ulcers wall poster is designed to assist patients with foot self-inspection at home. Patients can place the 11"x17" poster where they normally perform their daily foot check. The poster is a large, visual reminder to look at those feet every day, and it helps answer the common patient question, "What am I looking for?" The green zone on the chart shows signs of healthy feet. The yellow zone shows conditions to monitor carefully each day. The red zone shows foot problems that are very serious on feet with feeling loss and likely require immediate medical attention. See a PDF sample of the wall poster. Price: $3.50 each. One poster is included with purchase of the Preventing Diabetic Foot Ulcers video. 25 copies of the poster are $2.00 each.